Last night there was more cloud around, so I went out to Sugarloaf Rocks to see if I could capture the sunset. There were a lot of people there (visitors down for Easter holidays). The sunset was pretty good I thought. So did this couple in front of me. This entry was posted on April 23, 2011 by ianwiese. 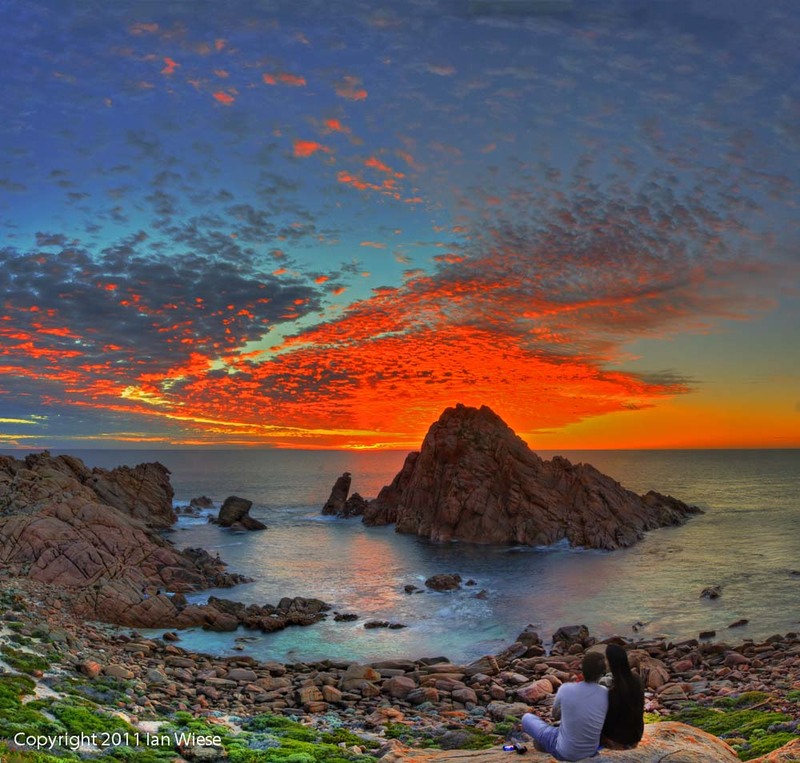 It was filed under Landscape and was tagged with couple, ocean, rocks, Sugarloaf, sunset. It does look a bit like that now that you mention it. I went to Sugarloaf because there were some great clouds, but further south the front was causing the cloud to cover the horizon. All this cloud was moving north, and for a while it was touch and go whether it would reach offshore Sugarloaf and ruin the sunset. Luckily it didn’t. I reckon your Injidup moon shot has some legs mate…Try dropping in a bigger moon and it will be really cool! Just change the blend mode to screen when you drop it in and it will blend perfectly! It has already gone to Hong Kong! I assume you are talking about the image on the right panel? I struggled with the moon – the human eye sees it much bigger than it really is, and you have to increase the size for it to resemble what you think you saw. But how big should it be? I guess it is a matter of trial and error, and I was a bit conservative. I thought the silver moon nicely balanced the crow on the beach, and that is why I had the horizon in the middle. Thanks for the tip regarding the blend mode – I haven’t played with screen mode yet, so I will give it a try. Just a bit of trial and error mate will get the size right! I will be interested to see it. This was at the leading edge of the front. All the sky to the left of where this image was taken was overcast.